The short answer is that only two metrics are fairly safe for comparison: AQH and Total Listening Hours. Don't compare Cume. Cume: the familiar count of unique listeners in a given time period (though each service defines cume a bit differently, as you'll see). 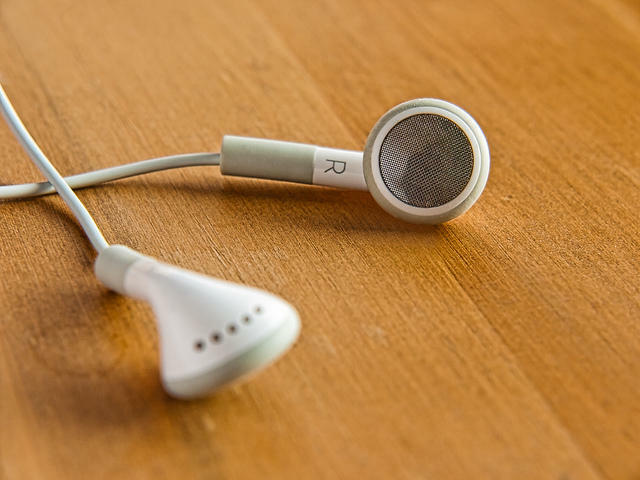 AQH: the average number of people listening for at least five minutes during a 15-minute period. Total Listening Hours (TLH or LH): the total combined time of all listening sessions of all listeners in a given time period. Average Time Spent Listening (ATSL or TSL): how much time the average person listened. Nielsen counts all listening sessions that include at least five minutes within a quarter-hour (sessions can be interrupted as long as they add up to five minutes). Triton, however, for most of its metrics, counts all sessions that are at least one minute long, and those sessions must be uninterrupted. This means that numbers in Triton will be inflated when compared to Nielsen. Cume in Triton will appear higher than it would if it were measured like Nielsen does, and ATSL will appear lower compared to Nielsen because so many more short sessions are included. It's just not an apples-to-apples comparison. 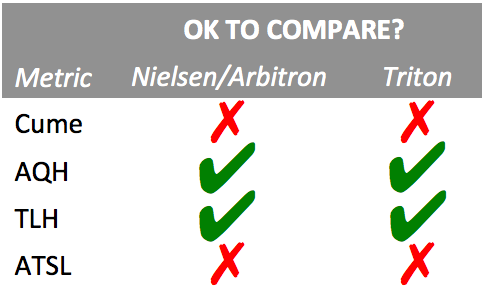 Nielsen counts people (via PPM and surveys), but Triton really counts devices (via unique IPs). An IP address could be a device that no one is currently listening to, or it could be an entire office of many people sharing one IP address. There's no way to be sure, so Cume is risky to compare. Finally, Nielsen essentially measures FM/AM signals only within a specific market, whereas Triton includes listening anywhere, not just in the local market. As you can imagine, this difference can make comparisons less reliable as well. So why are AQH and Total Listening Hours safer to compare? AQH is the closest we get to apples-to-apples comparison, because Triton uses five-minute sessions as the threshold for its version of AQH, not one-minute sessions. The calculation isn't identical to Nielsen, but it is so similar that any resulting differences are negligible. In addition, the Media Ratings Council recently accredited Triton's AQH metric, so we can all be more confident using it. Total Listening Hours (TLH) is also fairly safe to compare. Even though Triton is counting 1-minute sessions as part of TLH and Nielsen is only counting sessions 5+ minutes long, when you add up all the listening sessions, these very short Triton sessions really don't add significantly to the grand total. When the average streaming session is almost an hour long, adding some 2-minute sessions into the total makes for a relatively small inflation. Feel free to use TLH for comparisons, but with a grain of salt. The big question is this: Are you comparing your broadcast and streaming numbers yet?